Zuccato is a company focused on the future, since 1868. In that year and in a small workshop in the province of Vicenza, Caltrano, the Zuccatostory has begun. Since then, throughout the twentieth century and up to today, thecompany has been able to innovate and renew itself. Initially the shop was a food stand, Federico Zuccato then had the idea to introduce the sale of the sauerkraut and in the early twentieth century the company controlled 100% of the production and of the distribution process. That is why, in the case of Zuccato, we can speak of a total control of the chain and, therefore, of a total quality control. Since 1992, the year in which Zuccato took part in the project “Quality Assurance”, until 2010 when the company got the certificate of conformity to the Standard IFS rev.5, all the certifications obtained are the result of a passion for quality that finds its roots in 1868. Since the early 90′s, the F.lli Zuccato company has adopted a ‘quality’ policy, from the criteria for a continuous improvement of the environmental performance, up to the adoption of the principles of integrated pest control for their main product which is what the Company is popular for: the sauerkrauts. Thanks to the staff’s commitment, this course has been put in concrete form through the certificates achieved from 1995 to the present time. The constant search for improvement and the goal of ensuring maximum transparency allowed the company to get its first certification, according to the ISO 9001:1994 norms, that has now been upgraded and implemented in accordance to the ISO 9001:2008; and in 2001, an environmental certification in accordance to the ISO 14001:1996 norms; then again, updated in 2004 to the ISO 14001:04. A further commitment by the company, since spring 2003, made it possible to achieve a product certification to guarantee the cultivation under an integrated management (DTP 021) and the chain traceability (UNI 10939:01 now ISO 22005: 08) in the production of cabbages. 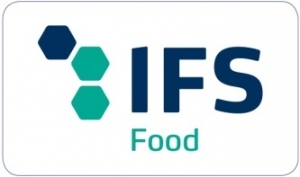 In 2009, the process of certification to the Standard IFS rev. 5, which ended in February 2010 with the acquisition of the certificate of conformity, has represented for the company a further step into the ‘integration of the quality system / environment` with new features and improvements as far management and infrastructures. Zuccato was founded in 1868. And like most Italian food businesses Zuccato was born in a small shop in a small provincial town. The town is in the province of Vicenza, and it is called Caltrano. The name of the company founder is Federico Zuccato. Geographically, the company has been at the foot of the Alps in the Veneto area wich quickly became one of the most important contributors to commerce and industry in the surrounding area. In 1884 the family Zuccato expanded with the arrival of Federico’s brother, Rinaldo. The company changed its name and is still distinguished today: Fratelli Zuccato. The beginning of this shop is a classic story. It was a shop where people could find a variety of food, such as bread, cheese, oil, or salted fish. Then Federico had the brilliant idea to introduce the sale of cabbage, that even in those years, the cabbage was an integral part of the culinary habits of the inhabitants of the Asiago Plateau? 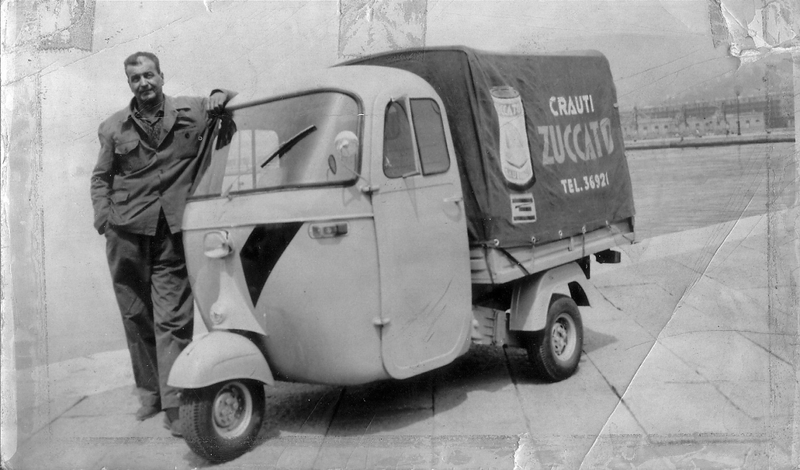 Sauerkraut quickly became a “flagship” for the Zuccato Brothers. Because of its popularity, the sauerkraut began to invade countries and shops near the main office. Bad weather in 1898 struck which helped the company ironically. Most of the fruit and vegetable crops in the area perished. The kraut, however, preserved in the typical wooden tub, survived which made it the only vegetable available. It was a success. The Fratelli Zuccato intensified production and distribution in the early twentieth century, and controlled the entire production process and distribution of its products. 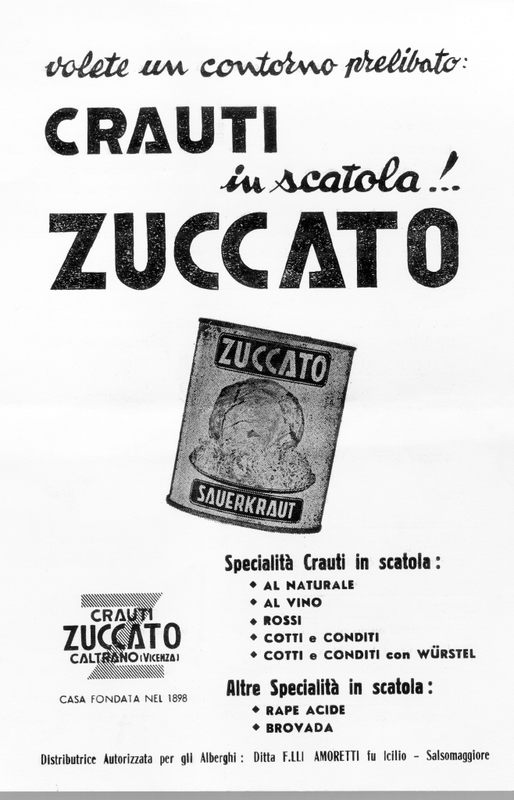 Zuccato’s success with the sauerkraut has not stopped despite World War I crisis. There was fighting near the company headquarters that hindered production. In the thirties, the company was among the first to adopt motorized machines. New generations of Zuccatos have continued to invest in raw material quality and technological innovation. Giustiniano, Battista, Rinaldo are the names of the pioneers that transformed the sauerkraut from a low-target, dull vegetable into a tasty and nutritious meal that can be eaten all year round. 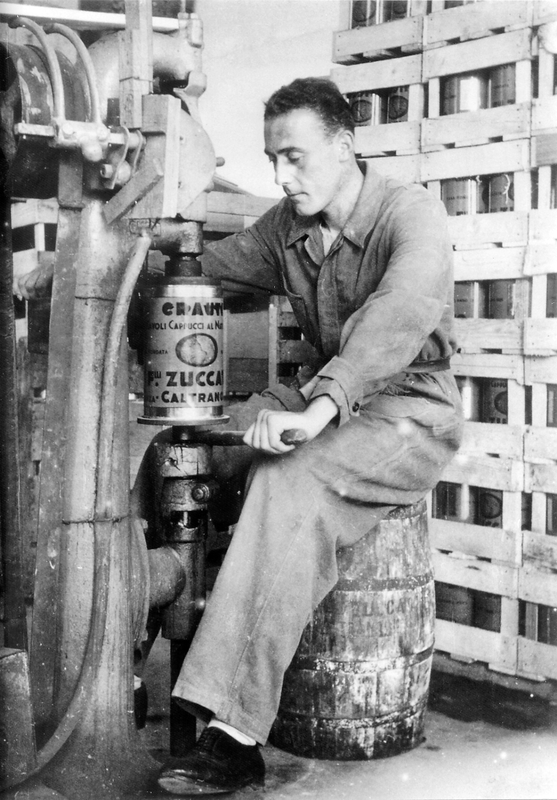 The Fratelli Zuccato were the first to process the sauerkraut in tin cans, thus preserving all the beneficial properties. Another great idea that allowed them to sell the product, in Italy and around the world, all year long, no matter the seasons. After the Second World War, the company started focusing on increasing its technology in monitoring the production and preservation of sauerkraut. In the eighties, the company has continued to invest in facilities and in technology. This has aided the process of automated production and quality allowing a greater range of products to be developed. Such as: sauerkrauts, cucumbers, pickles, olives, in oil products. All products of Zuccato always follow the philosophy of the founders: quality control of raw materials, processing and the use of cutting-edge technology. The Fratelli Zuccato, today, has been turning out more than 10,000 tons of vegetables annually. The production process and control systems using advanced technologically are largely automated. The packaging lines are independent and separate. If you add all this care and select of raw materials, it is easy to see why those who eat Zuccato’s products savor a special taste.